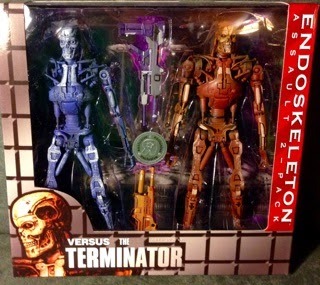 Today I am reviewing the awesome NECA Endoskeleton Assault 2 - Pack (Toys R Us Exclusive) that my wonderful wife got me for my birthday. 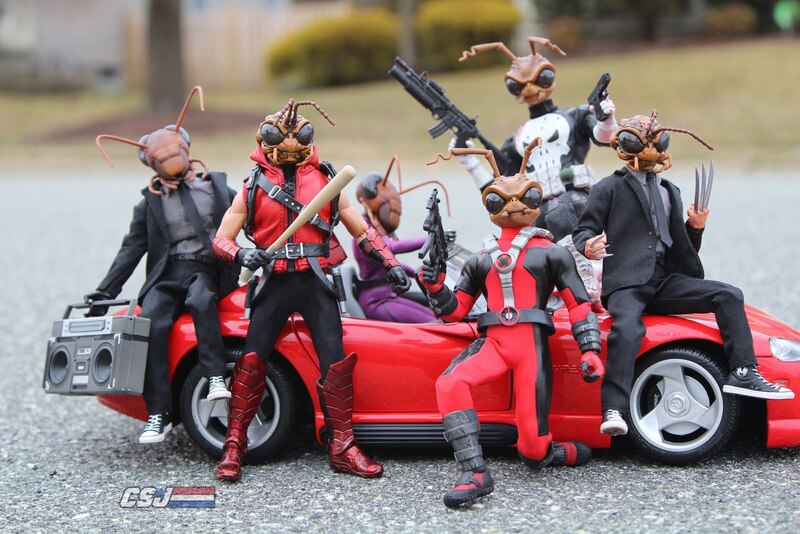 To be honest, these were not my most anticipated figures coming out from NECA this month. I have really been looking forward to getting my Queen Alien and Snake Plissken. With that said, when I got these I was absolutely blown away. I am not exaggerating when I say that these guys go right up with there with some of my favorites figures that NECA has made. 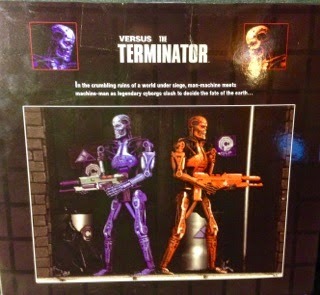 As always, NECA makes sure they get every little detail just right and the packaging and box art is awesome. 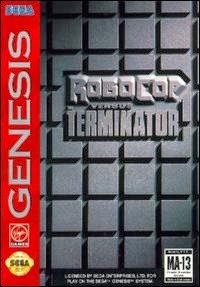 They have the same SEGA-style packaging as the game that we all loved to play so much had. The back reads. 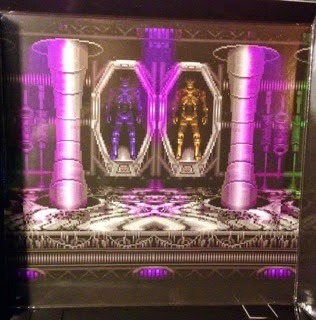 "In the crumbling ruins of a world under siege, man-machine meets machine-man as legendary cyborgs clash to decide the fate of the earth..."
The art inside the packaging is fantastic and looks like it is straight out of the game. Personally, I really appreciate that they take the time to get these extra bonuses just right. I love to use these inserts as backgrounds for when I am posing my figures for pictures and such. It makes it look like the real environment from the game. Since, the Endoskeletons are straight up machines that never change there is no need for extra hands, heads, etc. 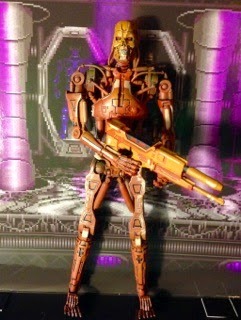 Each figure comes with the signature pulse rifle with a paint scheme that matches each of the figures. The figures themselves are just amazing. They are well built and feel quite sturdy in your hands. The paint on these guys is what really makes them pop. One of them comes in a blueish/purplish scheme while the other comes in an orange/bronze color scheme. To be perfectly honest, I don't know which one I like better. Due to the contrast of the colors they compliment each other very well. Also, you will notice the amazing details on them. When you look closely you can see the nice job they did of making them look worn and slightly battle damaged. Again, it's those little details that put these over the top. On Twitter, some one was asking if they are fully articulated. 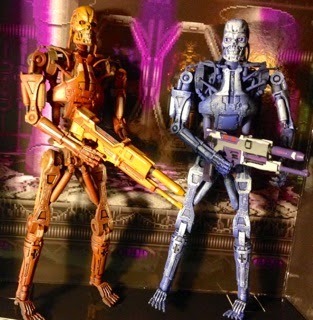 Well, since these are made by NECA you already know the answer is yes. Pretty much every joint on here can be moved from the toes, ankles, knees, hips, waist, hands, arms, and head. 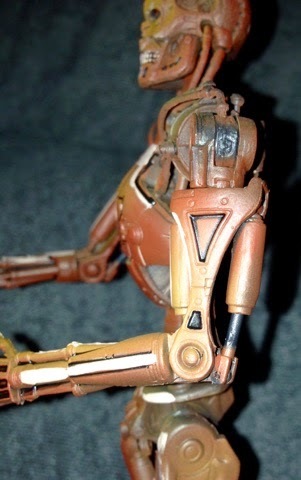 One of my favorite things about this figure is that when you bend the joints and pose the figure it leaves the inner mechanical parts of the figure exposed. It is a nice touch. I took a picture of the arm straightened vs bent so that you can see what I am talking about. The legs and other parts do the same. These figures have definitely exceeded my expectations. They are super fun troop builders and I will be buying more of them. 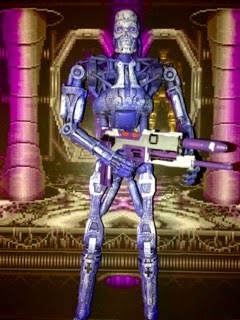 Steve already has gotten the single version with the Gatling gun and I will be picking him up soon as well. 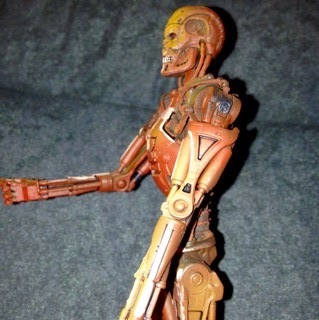 NECA's Endoskeltons really blow the old McFarlane ones out of the water. It's not even a comparison. I strongly suggest that you stop by your local Toys R Us or go here to pick these up. I promise you won't be disappointed. I never would've made that Sega connection. That's so cool. Really does make me wanna drop the cash for this set. Great review man. 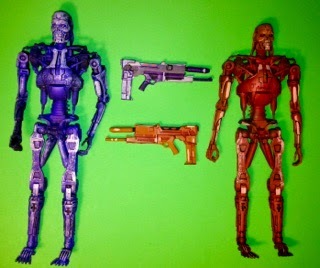 Mine are on the way along with the Gatling gun version and the two new Robocop figures.